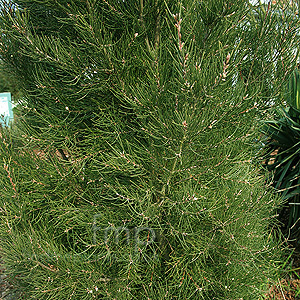 This upright exotic small to medium sized tree is native to Tasmania, so not fully hardy. You might mistake this plant for a conifer due to the needle like dark green foliage and upright growth, however sweetly scented summer blossom give this plant away as an angiosperm. Cultivation tips: Hakea is a distinctive tree is grown for it distinctive dark foliage and sweetly scented white summer blossom. This tree is not fully hardy throughout the UK and it should only be planted in a sheltered location. It requires a fertile lime free soil.